The truth? You want the truth? 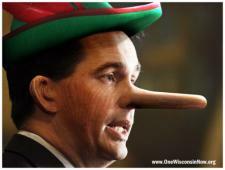 Scott Walker can't tell the truth! The gentle reader might have noticed by now that Scott Walker is a compulsive liar. Whether its about his record on job creation or dealing with protesters or Saint Ronnie's Bible, Walker simply can't tell the truth. The worst part is that he's not very good at it and always get caught in his lies. Wisconsin Gov. Scott Walker says British Prime Minister David Cameron confided in him that he was concerned about the direction of American leadership. But there’s a problem with the Republican’s tidy critique of President Barack Obama: Cameron doesn’t remember it that way. Walker would have been better off punting. I'm personally not surprised that Walker would lie about the British Prime Minister confiding anything to him. What does surprise me a little is that he didn't say that it was the ghost of Margaret Thatcher telling him this.